Kiddie pools have changed greatly over the past hundred years. They have not only become more economical, but they’re also a lot safer and a whole lot more fun for children to use. And thanks to innovative product designs, there are a lot more styles for consumers to choose from when they’re searching for one of these pools for their household. There are the hard plastic pools that most people are familiar with from their childhoods, convenient to use inflatable pools and even pools with slides. All of which leaves the consumer with an extremely important decision to make: Which children pool is the right one for their children? Fortunately, we are here to help the consumer find a suitable swimming pool for their child and for their household. One that will not only help their children seek refuge from the summer heat but will enable them to have hours and hours of aquatic fun. And do it all while helping their parents keep them safe. With these goals in mind, we have reviewed some of the best slides available. If that’s not enough, then we have also written a guide which will help people find a product that’s suitable for them, their children and their family. 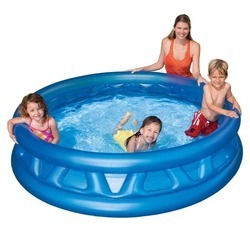 Toddler pool parties are all the rage nowadays and now thanks to this high-quality molded plastic pool, your toddler can throw the best party in the entire neighborhood. Manufactured with molded-in ocean creature designs and molded-in seats, this product is as visually exciting as it is easy-to-use. It’s designed to hold a 40-inch umbrella, to provide the young ones with shade from the sun and comes with its own shade umbrella. This pool also comes with a water play-set that attaches to the umbrella to further broaden your child’s playing options. The best part about this set, however, is that it requires little adult assembly and is ready to go to be used in no-time flat. Hours of aquatic fun awaits the lucky toddlers who get the opportunity to use this pool. With the increased awareness about how UV exposure can contribute to skin cancer, it’s no wonder that parents are really considering their options when choosing a pool for their children. Fortunately, this particular pool has considered those concerns and have created a pool that’s designed to help protect children against the sun while they’re playing in the water. It protects children from the sun by using a UV-resistant shade. This product is also designed with a heavy galvanized steel frame that’s virtually rust resistant and uses heavy-duty polyester and PVC for the side walls of the pool. This makes it extremely sturdy and prevents it from prematurely collapsing. All of which ensures that it keeps your children as safe as possible when this product is used with adult supervision. Any parent looking to introduce their children to the pool may want to take a closer look at this product. This 5-foot by 15-inch pool holds up to 153-gallons of water when it’s filled to 90% capacity. One of the best things about this product is that it’s extremely easy to set up and to take down. Another plus is that it’s made with heavy-duty PVC and has 3-ply side walls made of polyester. And since this product is inflatable, it can not only be used by children but can also be used as a pool for your dog. It’s sure to provide a safe haven to any children looking for a little bit of aquatic fun to escape the summer heat. Convenience is one of the biggest advantages to using this pool. Unlike many of the other wading pools currently available, this pool doesn’t require to be inflated to be used. All the user has to do is unroll it and fill it up with water, it will automatically snap in place as water is what holds it up. This product is 15-inches deep and is 6-feet from side-to-side, so it has an approximate water capacity of about 258-gallons. That’s more than enough water to allow several children to play but not enough that it presents an unreasonable safety risk. The outside of this pool has an exciting deep color reef design that’s never out of place. Taking all of these factors into consideration, as well as the durability of the product, it’s easy to see why this pool is popular with some people. Why pay a fortune to take your family to a water park when this pirate-themed inflatable water slide and bouncy play center will do more than an adequate job of recreating the experience in your own backyard? This play center is so big that it will take 2-minutes for its electric air pump to inflate it to its full size. Don’t worry though, because it’s definitely worth the wait. This center is 20-feet long, 12-feet wide and 8-feet high, and features a slide that’s 90-inches long and 24-inches wide. It also features a large splash area, a crawl tunnel, a climbing wall, and dual water-spray cannons. Another innovative feature that has is a bouncer, and the whole unit is made from high-quality materials that enable it to hold a combined weight of 500-pounds. This inflatable play center has a cool shark design that makes it not only fun to use during Shark Week but all summer long. It’s approximately 15-feet long, 5-feet 6-inches wide and 5-feet and 2-inches high, which gives plenty of space for hours of summertime fun. It’s also made out heavy 16-gauge vinyl that makes it very durable and holds up to even the most rambunctious children. Included with this play set are two surf-riders with heavy-duty handles. All the user has to do is wet the surface with an ordinary garden hose and then surf it using the surf riders. Parents can enjoy watching their children “riding” the shark hour after hour as they ward off the intense heat of summer. It’s a play-set that’s sure to get a lot of use in just about anyone’s household. Designed for children 2-years and older, this high-quality play center can hold approximately 74-gallons of water and provides more activities than most kiddie pools do. This dinosaur-themed play center features a mini-slide that children can slide down, a wading area for individual play and a ramp for rolling balls down. It also has a “dino arch” that sprays water. Once inflated, this product is approximately 131-inches long, 90-inches wide and 44-inches high. Its dinosaur theme will also excite the imagination of your children and will enable them to pretend that they’ve been transported far away to the waterfalls of the Jurassic Age. All of which makes this colorful play-set one that anyone with a toddler or small child would want to have in their backyard. Anyone searching for an inflatable play center for their backyard may want to take a closer look at this product. This play center has a sweet Candyland theme to it that’s not only visually stunning but also ignites the imagination. It comes with a waterslide for sliding fun, two inflatable lollypops that can be used for swordplay or for other activities, and a long rail that one of the six included balls can be rolled down. This play center’s arch has a sprinkler function that adds just a little bit extra to the whole experience. Also included with this high-quality set is a landing mat that gives a little bit of extra padding when using the waterslide. Designed for children age 2 to 10-years old, this product is a fun and colorful addition to any backyard or play area. Children have been pretending that they’re knights and princesses ever since the medieval age, so it shouldn’t really be a surprise that someone has finally come up with a Fantasy Castle pool play center that will allow them to take the fantasy even further. This inflatable play center looks like it has castle walls and towers, and it even comes with an inflatable dragon! Adding to the theme, this product also comes with an inflatable shield and scepter. Designed for children 2-years of age and older, this product can hold 47-gallons of water and comes with a water slide with a soft landing mat. It also has an easy-to-use drain plug and is approximately 73-inches long, 60-inches wide and 42-inches high. It also comes with a repair patch in case of an emergency puncture. Regardless of whether you live in Southern Florida, where alligators and crocodiles coexist side-by-side, or simply want to capture that experience, this gator-themed play center is sure to provide a summer’s worth of fun. It’s designed with an inflatable gator, two inflatable fish and a duck, and even comes with an inflatable fishing bucket. Another addition to the theme is an inflatable mushroom that provides the children with a little bit of shade against the sun. This product has a width of 5-feet 8-inches, a length of 6-feet 8-inches and a height of 2-feet 11-inches. It holds approximately 48-gallons of water and is a great play center for combating hot summer days. This play is highly durable and is designed to stand up to even heavy-duty use. Designed for children two-years and older, the Intex Rain Ring Inflatable Play Center is a good pool that will provide hours of enjoyment for your child. It inflates to a size of 117″x76″x53″ and features a wading area, a water slide, and a ring toss game. It can hold up to 77-gallons and is designed to be used in shaded areas where it isn’t in direct sunlight all of the time. It can also be used as a ball pit—if you so desire—and provides plenty of room for your child to play. It’s a pool that can be used all summer long. The Intex Dinosaur Play Center is not only a fun wading pool but is also an interactive play center that can provide hours of entertainment during the blistering hot summer months. Children can slide down this model’s volcano shaped slide or hang out under the waterfall before putting fun balls directly into the dinosaur’s open mouth. With a 57-gallon capacity and the option to hook up a garden hose to active the palm tree sprayer and the waterfall, this model is sure to keep your children nice and cool all summer long. And because it has a drain plug in its floor, it can be drained and put away in just a few moments. Designed around a tropical theme, the Intex Ocean is an inflatable play center that is actually composed of two pools in one cool design. It has a large wading pool and a smaller pool—both of which have drain plugs so they can be drained independently of each other. And if you attach a hose to this model, your children can enjoy the built-in sprayer that has a control valve that allows its strength to be adjusted according to personal preferences. Another great feature that this pool has is it water slide—sure to provide a whole lot of fun over the summer months. Constructed from durable and high-quality PVC, the Banzai Wild Waves Water Park is a kids pool that is approximately 88″x54″x50″ and comes with a number of activities to keep children occupied. It features a ring toss game with 4 inflatable rings, a basketball hoop and backboard with an inflatable basketball and a step-up slide and an arch that sprinkles water. It’s primarily a wading pool, however, and will keep your kids nice and cool even through the hottest summers. It’s a model designed for parents who are looking for something that’s a little more than just a children’s pool. Designed for use with small children, this Intex pool is a whimsical and well-designed unit that should provide your children hours of fun and enjoyment. This pool can hold approximately 14-gallons of water, which provides about 4-inches of water. This model can be easily inflated in only a matter of moments and can just as quickly be deflated for winter storage. With an approximate size of 44-inches by 36-inches, this pool will give most young children ample room to move around and play. And with proper supervision, this model can be used for children as young as a year old. The Intex Swim Center Clearview Aquarium Pool is a square pool that measures 62.5-inches by 62.5-inches by 19.5-inches and provides plenty of room for a couple of children. It has a very vibrant and eye-catching design that allows this pool to be placed just about anywhere and not look out of place. This pool’s conventional design also makes it the perfect choice for not only swimming but also for use as a ball-pit. Fill it with balls and your kids will have a good time in it. This pool comes with a drain plug that allows it to be quickly deflated and a repair patch to fix it if it ever does spring a leak. This unit is great for use by the whole family. This 2-ring swimming pool is made using high-quality vinyl and can be inflated in no-time flat. It is made in a variety of assorted colors and is the perfect wading pool for small children–when used with proper supervision. And when this pool has served its purpose and provided a summer of entertainment, it can be deflated quickly and folds up to a compact size that allows it to be taken just about anywhere. While it doesn’t have all of the features that more expensive models do, it is a nice basic pool that’s durable and easy to use. While it’s not the easiest pool to inflate and deflate, the Intex Sun Shade is one that’s sure to provide hours of summer fun. It inflates to 62 x 62 x 48 inches and can hold approximately 74-gallons of water. This model has an inflatable shade that keeps the direct rays of the sun off of the child while they’re playing in the pool. The Sun Shade may not have all of the features that many of the play center models have but it is stable, reliable and does a good job at protecting children from the summer sun and heat. Designed around a whimsical aquatic theme, the Intex Summer Lovin’ model has a number of features that extend its usefulness beyond just being a pool for young children. It has a dolphin sprayer that sprays water when the pool is attached to a garden hose, a removable sunshade and a ball hoop that comes with an assortment of small balls. This unit has a 21-gallon capacity and is made from heavy grade vinyl that makes it very durable. It also has a drain plug to drain it easily and a repair patch to fix it if it should ever spring a leak. 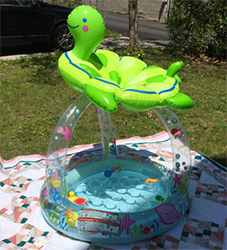 The Turtle Shade is a baby pool that has a cute design and is designed for use by children ages 1 to 3-years old. It has an inflatable floor that is very comfortable and a turtle-shaped sunshade that partially protects the pool from sunlight. This model can be inflated to a size of 40″x42″ and has a capacity of approximately 12-gallons. It’s just big enough for one small child to fit in while their parent supervises them from outside the wading pool. It’s a unit that can be used both indoors and outdoors easily and is sure to provide summer fun for your child all summer long. When it comes to kids swimming pools, parents have three distinct options to choose from. There are hard plastic pools, inflatable pools, and pools with slides. Which one you choose depends on your particular needs and your budget. Below are some of the features to consider when buying a kiddie pool. Not every pool size or shape will fit every person. Some people only have one small child, so they may need a smaller model than someone with four kids. Which is why it’s important to consider the dimensions of the unit before purchasing. While you certainly don’t want to buy a model that’s bigger than what you need, you also don’t want to buy one that’s smaller than what you need. Most models that you can find on the Internet show their dimensions in their listings. The shape of your pool is also very important to consider. Many of the play center models have odd configurations that may include inflatable castles, turtles or other such features which may make them difficult to place in the location you want to place it in. For example, you might want to place your pool at the corner of your house, which may make more of a square or rectangular design more suitable. Another thing to consider is what the pool is made from and not every pool is equal in its use of construction materials. Some pool manufacturers use a cheaper plastic which may not hold up to rougher play or hot summer temperatures as well as some other models that may be made from higher quality vinyl or PVC material. The hard plastic pools are generally the most durable. And depending on what they’re made of, they can also be easy to setup. Many of the molded models require almost no-setup and are extremely durable, but the snap-in models are also usually durable and easy-to-setup as well. If you’re considering buying one of the inflatable pools or one of the inflatable play centers, then you should consider the gauge of the vinyl or PVC that it uses. Make sure that it has a high-gauge, which indicates a thicker product. Usually, 14-gauge or higher is sufficient for most pools. Safety is another important consideration to keep in mind while buying a pool. The first thing that should be realized is that any pool can present a danger to a child, which is why it’s important to always follow the warning labels and instructions for the pool and to never leave the children unattended. When looking for a pool for a younger child, try to get one that’s wider at the base and more narrow at the top. This will help prevent the sides from collapsing and the child falling head first into the water and drowning. Some hard plastic pools are safer than other options because they are either made from hard molded plastic or are kept up by the pressure of the water itself. We’ve decided to go ahead and take an even closer look at the three types of pools for children that are currently available: hard plastic, inflatable pools, and inflatable play sets. Each of these pools each has their own positives, so it’s beneficial to look at them individually. Although these pools aren’t the cheapest, they are some of the most durable of the three types of pools. That’s because they are made from either hard plastic or are made in a way that they are held open by the weight of the water that’s placed in them. They are also often very easy to set up and easier to take down—if they even need to be taken down in the first place. Some are merely put away intact, which can make some of them difficult to store. Inflatable pools are usually the most inexpensive of the three pool types and are usually the easiest to store. While it does take some time to inflate them for use and deflate them when it’s time to put them away, that’s not usually a big deal because they are often smaller than inflatable play sets. A problem that often crops up with these type of pools, however, is that they can get punctured during use. Fortunately, many of them come with repair patches just for those instances. Inflatable play centers are usually the most expensive, but they are also usually more durable than inflatable ring pools and more versatile than hard plastic pools. They come in a variety of themes, which make them more attractive to children and they provide more play activities than any other pool type. And since they’re often made of high-quality PVC, they are usually more durable than other pool types. It’s also important to consider the features that you may need before you buy a pool. For example, some people may need a pool that comes with a shade because they want to limit their child’s sun exposure. Other people may want slides and/or basketball hoops included with their pools, while still other people may favor some kind of sprinkler system. It really doesn’t matter what additional features you include, so long as they provide you with the options you’re looking for. As you can plainly see, there are a wide variety of different types of pools available for children and each one is unique in their own way. The only real way to decide which one is right for you and your family is to look over some of the better models on the market, consider all of the options it may have and make an educated buying decision. If you take the time and do it right, then you can rest assured that you’ll get a pool for your kids that will fit not only their requirements but yours as well. And that’s a formula for having a happy fun-filled summer for everyone.